Welcome to October...the month of crunchy leaves on the ground, too much candy corn and a heightened awareness of breast cancer. I don't think there is anyone that has not been touched by the disease, whether personally or through friends and family. Moms, aunts, sisters, cousins, old college roomies - we all know someone that has fought breast cancer. Women all over the country will be participating in walks and runs, selling baked goods and pink emblazoned everything to raise funds to fight breast cancer this month. 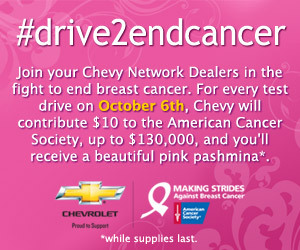 Join your Chevy Network Dealers of Northeast Ohio in the fight to end breast cancer. 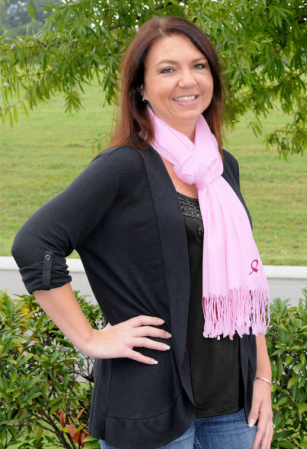 For every test drive on October 6th, Chevy will contribute $10 to the American Cancer Society Making Strides Against Breast Cancer initiative, up to $130,000, and you’ll receive a beautiful pink pashmina. Contributing to the fight against breast cancer has never been so easy. Looking for a participating dealership? Check here. Keep track of the initiative by “liking” Gotta Love Chevy NEO on Facebook or by following the #drive2endcancer hash tag on Twitter. Whatever you do, go to your Chevy dealership on October 6 and go for a test drive. This is a sponsored post care of the Chevy Network Dealers. My thoughts and opinions are my own. For my part? No thanks. There are chemicals in car exhaust that help CAUSE breast cancer. And only $10 per test drive? Big deal. This is just a marketing opportunity for Chevy--nothing more. As an actual survivor of breast cancer, I have no interest in the annual pink marketing party of October at all. No walks, runs, baked goods or pink products for me! If those could get rid of breast cancer, it would've been gone long ago. What we need are concerted dollars going toward research into the causes, prevention and eradication of this disease once and for all--directly to the researchers--not pretty pink "awareness" marketing stunts year after year after year. Breast cancer should be regarded as a disease that still kills far too many women--not a marketing opportunity or something to celebrate every October. Sorry you feel that way. You are certainly entitled to your feelings and opinions. I however, feel that the American Cancer Society is a reputable organization and if by me simply taking a test drive they will receive a donation, I'm all for it. Best of luck to you.